Darryl Becenti Stamped Repoussée Sterling Bracelet size 7"
Chacodog has been offering Darryl Becenti's pieces since 2003; initially this repertoire consisted of rings, deeply-stamped bracelets without stones and pendants with fine natural turquoise. Darryl is painstaking about the precision of his stampwork and he has a particularly good eye for combinations of stamps. 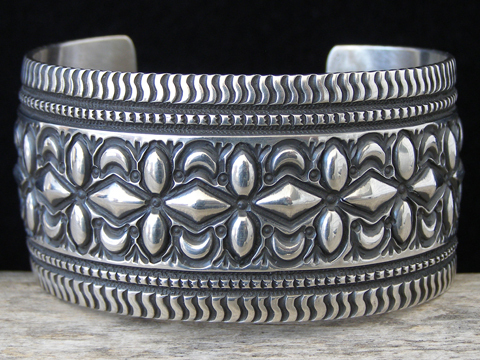 This classically traditional stamped Sterling bracelet combines the textural elements of deep stampwork with raised repoussée motifs encircling the cuff. The cuff displays a matte finish with the stampwork more deeply oxidized than the smooth surfaces. Formed to a gently convex surface. Impeccable detail and workmanship. Hallmarked with a capital D.Becenti over an arrow in flight and stamped Sterling inside. Uniform width of cuff: 1 7/16"
Terminal to terminal: 5 3/4"